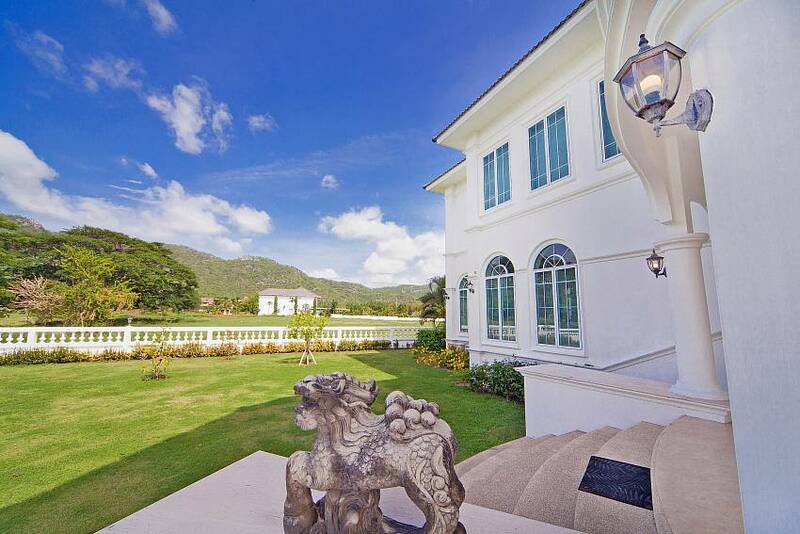 The Hua Hin Manor Palm Hills is an impressive 8-bedroom residence set in its own spacious grounds. 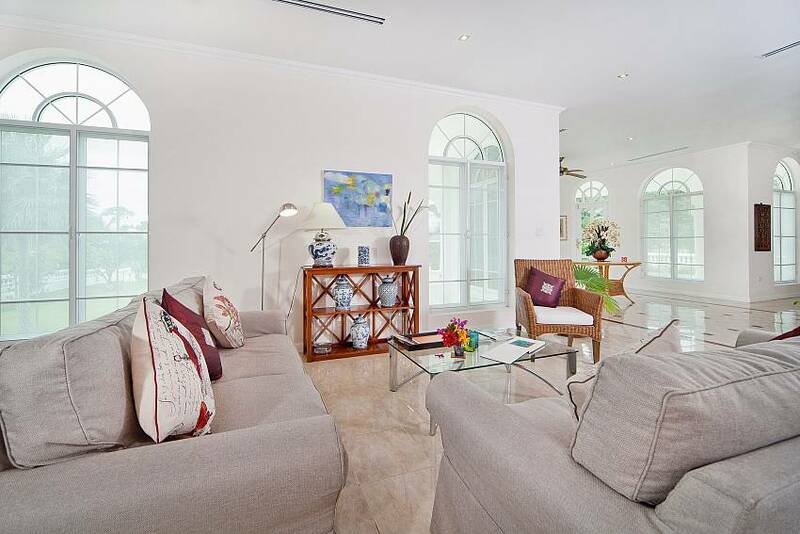 This stunning holiday home is located in the luxurious, private grounds of The Palm Hills Golf Club. 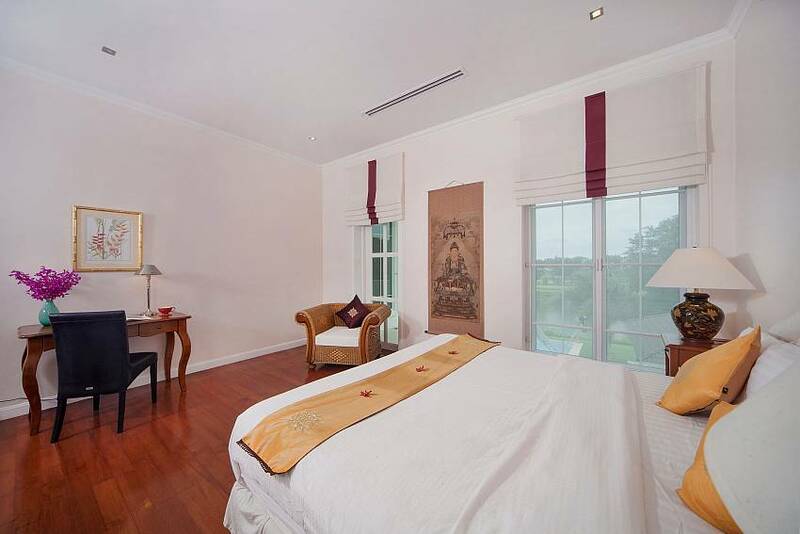 From the beautifully manicured, sprawling garden with private swimming pool and covered dining sala, enjoy the majestic view of the lake, 7th tee, and forested hills in the background. 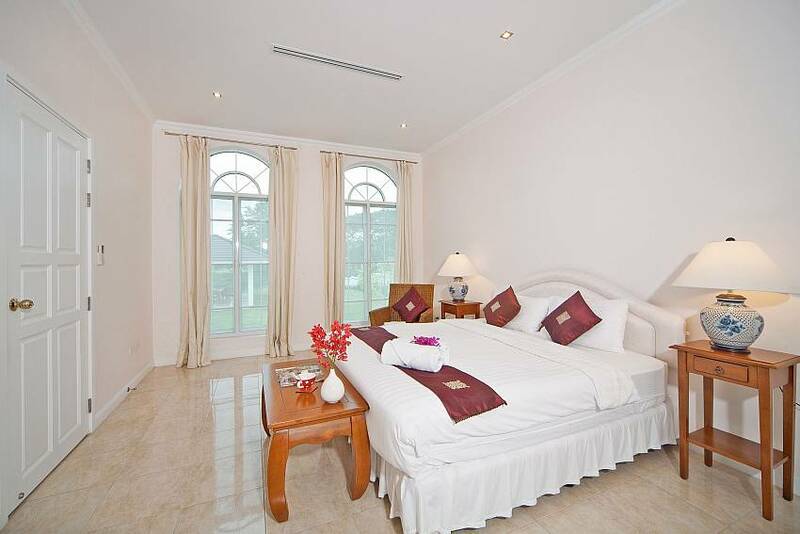 The Hua Hin Manor Palm Hills is a spacious 8 en-suite bedroom, 9 bathroom, luxury property set in its own grounds. 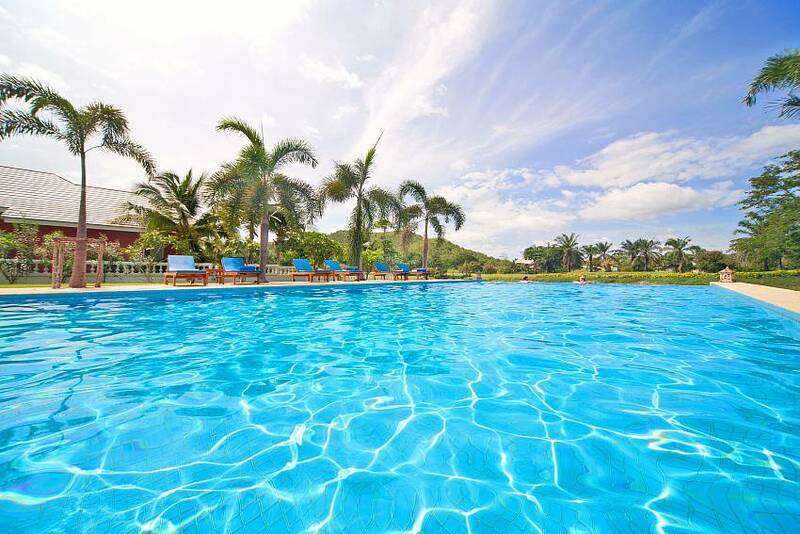 Its location amongst the leafy, private grounds of the tranquil Palm Hills Golf Club offers something for golfers as well as those simply looking for a tranquil retreat in relaxing and peaceful surroundings. 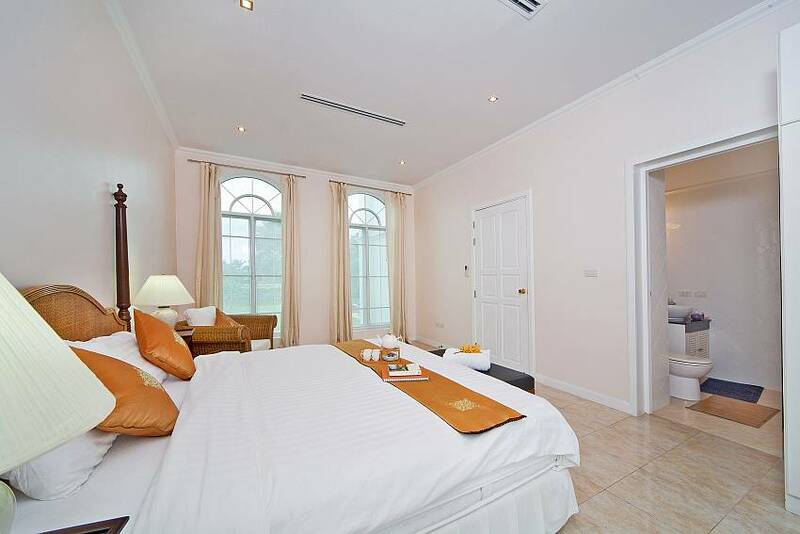 It is just 10 km from the charming Royal seaside city of Hua Hin with its long stretch of beach, renowned night market, and history as the holiday choice of kings. 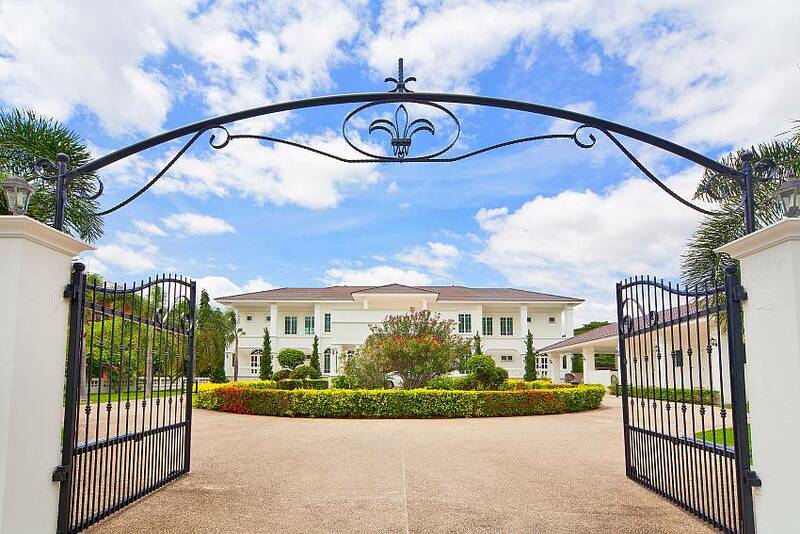 As you enter the Manor through the automatic double wrought-iron gates this property immediately impresses you. 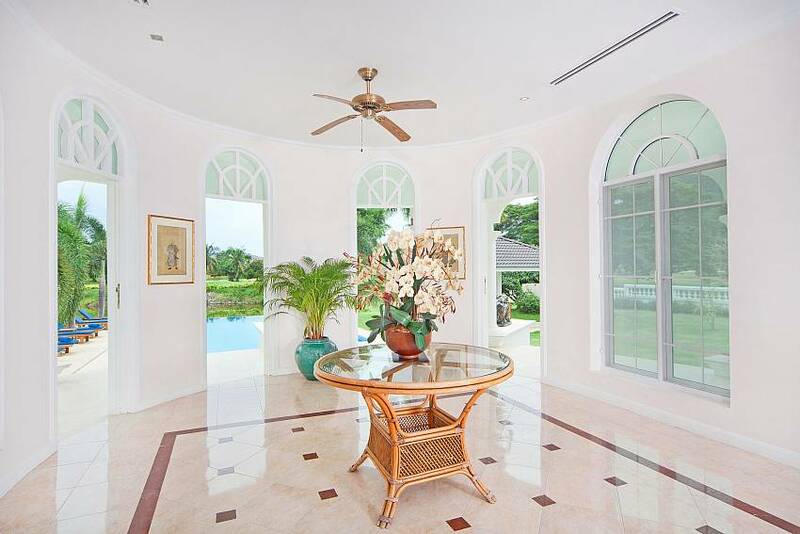 The circular driveway has King Palm Trees set in lawns to either side with a circular garden in its centre. There are maid’s quarters to your right and a covered carport for two vehicles. The impressive main entrance is via tiled steps and large double wooden doors to the centre of the Manor. You also can access the front door from the carport via steps and a walkway. Once inside there is a foyer with bookshelf, sofa and coffee table to your right, and a sweeping wooden staircase to our left. Staying on the ground floor you pass through an arch into the main living area. Its Georgian style windows and several sets of patio style doors offer direct access down oval steps into the hugely spacious and impressive rear garden. Here you will find the large swimming pool, gardens and impressive dining sala with its large wooden dining table and chairs. This is an ideal spot for lunch or dinner. 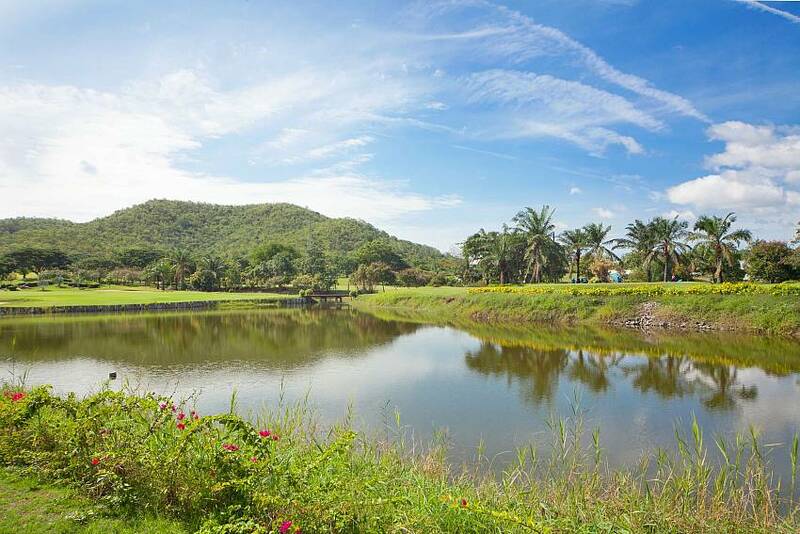 The views from here are idyllic; you overlook a calming lake, the 7th tee of the golf course, and have forested hills as your wonderfully relaxing backdrop. While non-playing golfers in your party relax in the Manor’s luxurious and spacious surroundings, golf enthusiasts are in for a real treat. Any person staying at the Manor is entitled to an extremely generous 50% discount on all green fees when playing the Max Wexler designed, beautifully maintained 18-hole Palm Hills Golf Club. 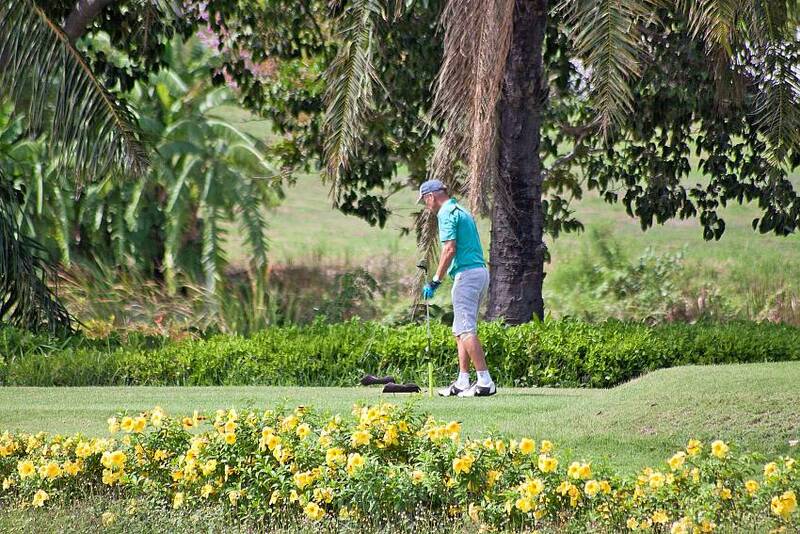 This was the first course in Hua Hin to gain international standard, and your holiday residence is just 1km from the Clubhouse. Before you tee off at the scenic 7th hole please give a wave to any of your party relaxing by the Manor’s swimming pool as this tee is just across a calm lake from ‘your’ spacious rear garden. Another benefit for your party is that anyone who is sports minded has full access to the private sports centre facilities in the Golf Club grounds. Charges are dependent upon the activity you choose, and are based on a ‘pay as you use’ basis. Two of the 8 en-suite bedrooms are at either end of the ground floor, and in keeping with the rest of the residence they have large Georgian-style windows facing the rear garden. To the front, both have patio doors offering front garden views. The new added pool house offers another 2 en-suite bedrooms with one extra living room. 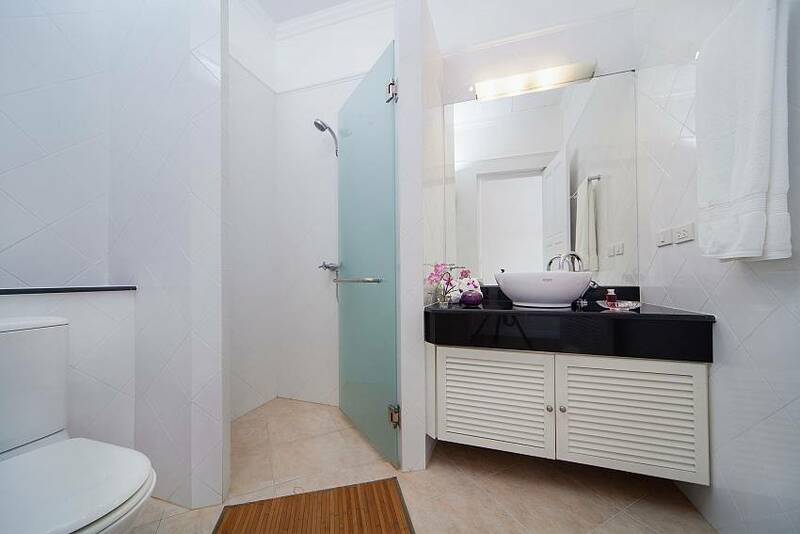 From the centre of the ground floor you have a comfortable lounge area to your left as well as a guest bathroom. To the right is the dining area with the fully fitted kitchen space beyond this. 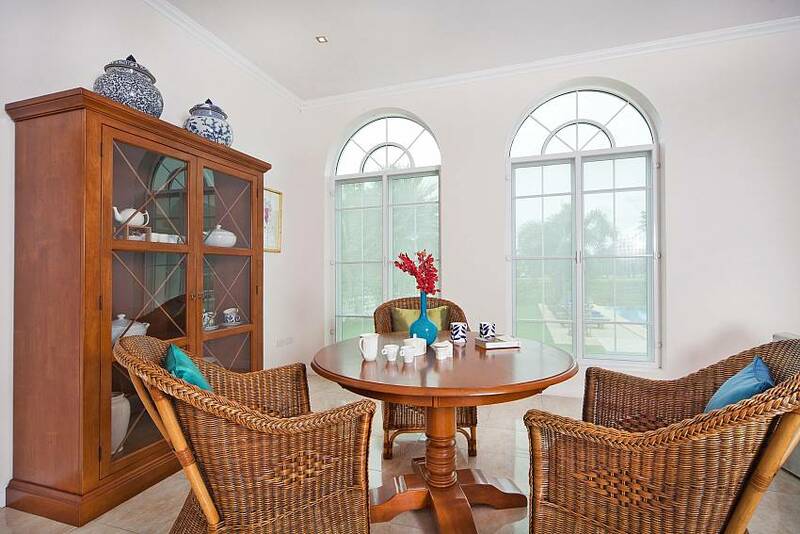 You will certainly dine in style at the impressive 10 place dining table with wicker dining chairs. 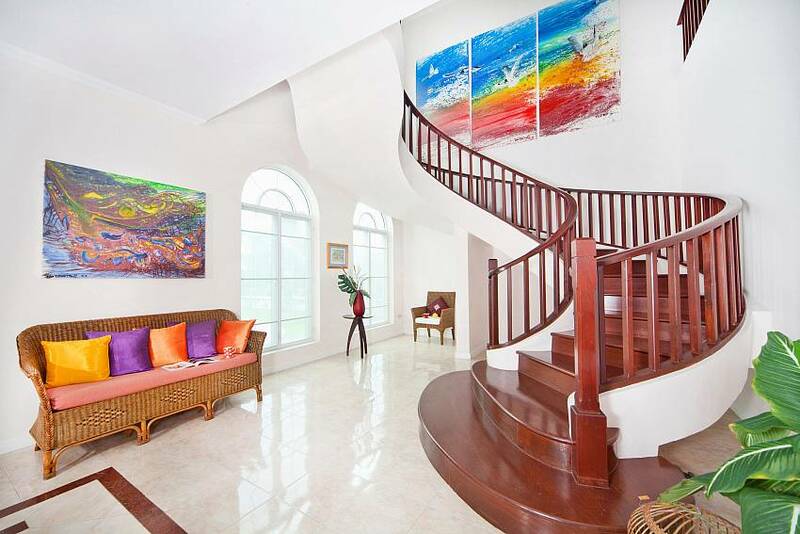 The sweeping wooden staircase offers a delightful glimpse into the luxury of the upper floor. 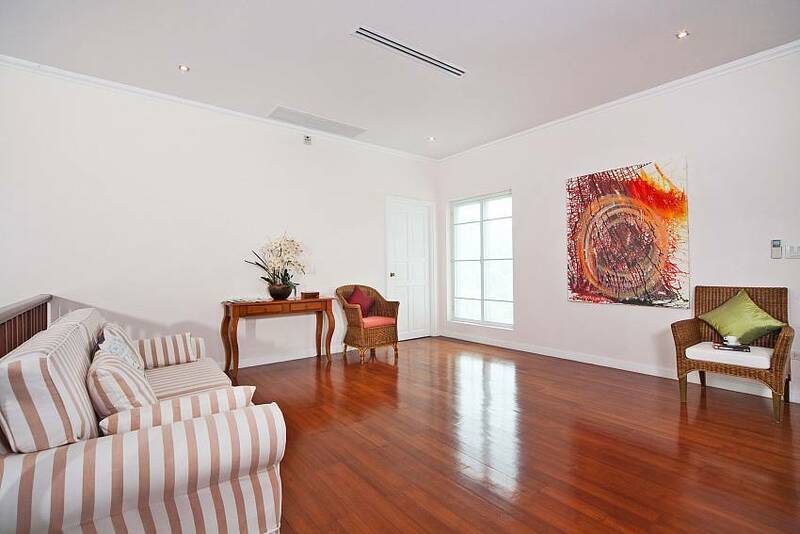 Highly polished wooden floors give added elegance to the two lounge areas and the four remaining en-suite s bedrooms. 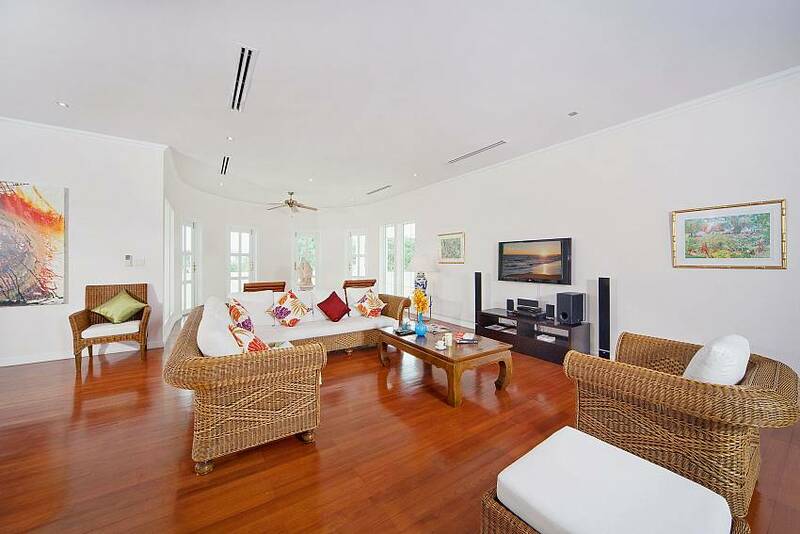 This floor has a large terrace to the front of the house and a semi-circular balcony to the rear, both offering wide views of the tranquil surroundings. The top of the staircase is where you will find two open-plan lounge areas with sofas, a pair of relaxing chairs with footstools and the wall-mounted Flat Screen TV offering international channels, a DVD player and surround sound system. 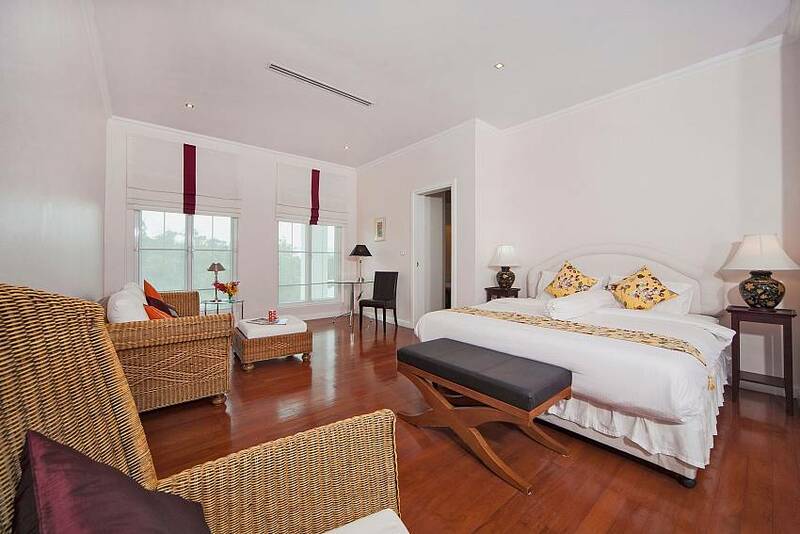 This floor also contains your 4 upper en-suite bedrooms, one of which is the Master suite. 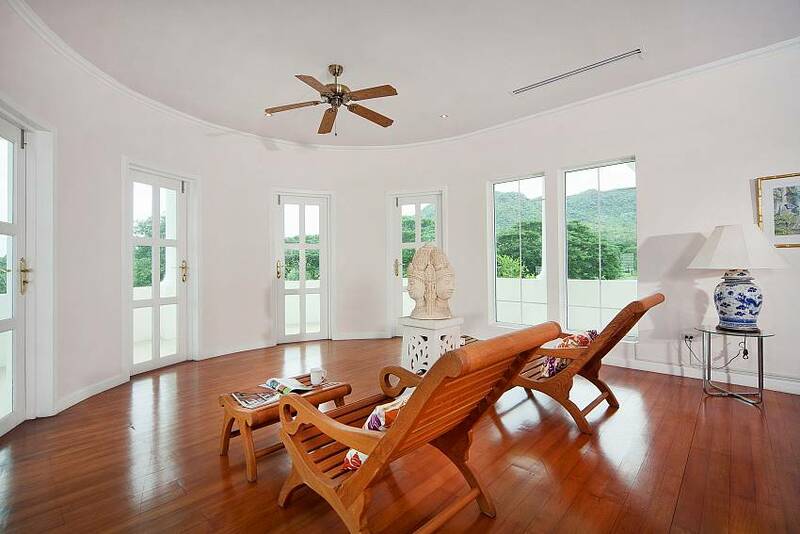 It is beautifully furnished and spacious with light from large windows at both the front and rear of the house adding to its ambience. 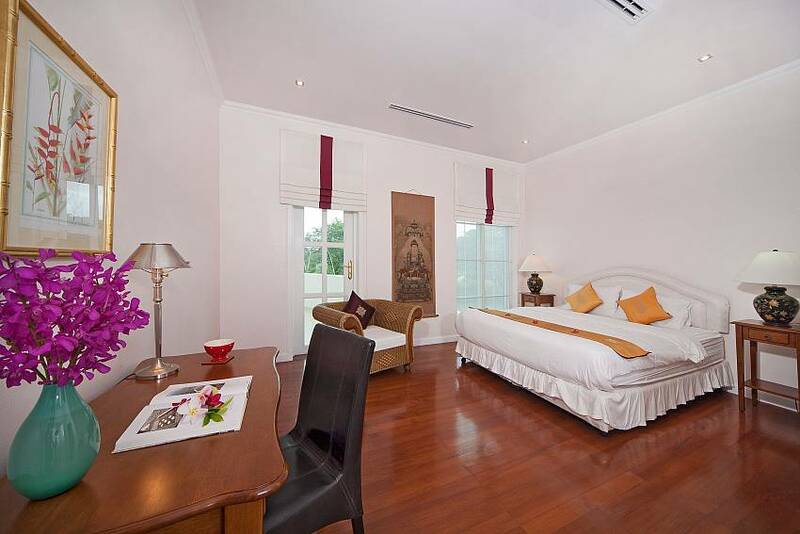 Hua Hin was the very first “holiday destination” in Thailand, chosen as the summerhouse residence for kings because of its natural beauty, pleasant climate, and proximity to Bangkok. While it retains its natural charm and beautiful beaches, recent development has brought a more upscale tone to laidback area. Don’t be surprised when you find wine bars, top-tier golf courses, art festivals, and fine dining alongside the seaside BBQs and relaxed pace of life. 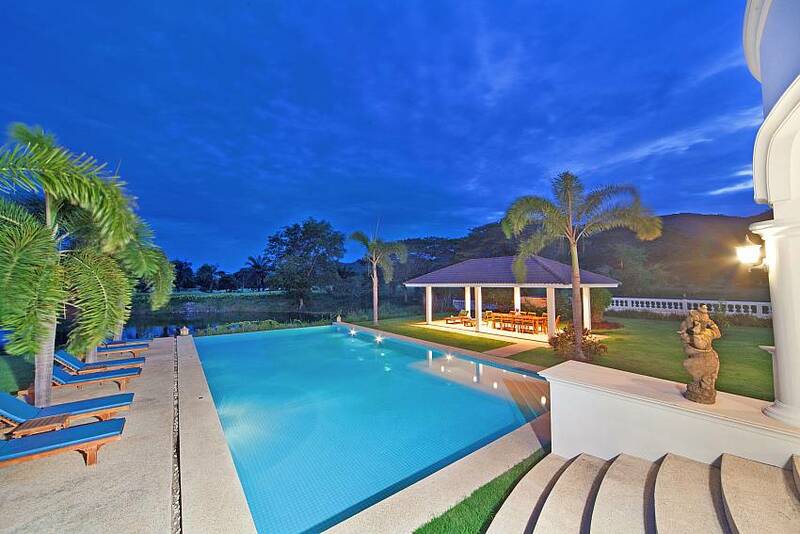 Browse our full listings of villas in Hua Hin here. 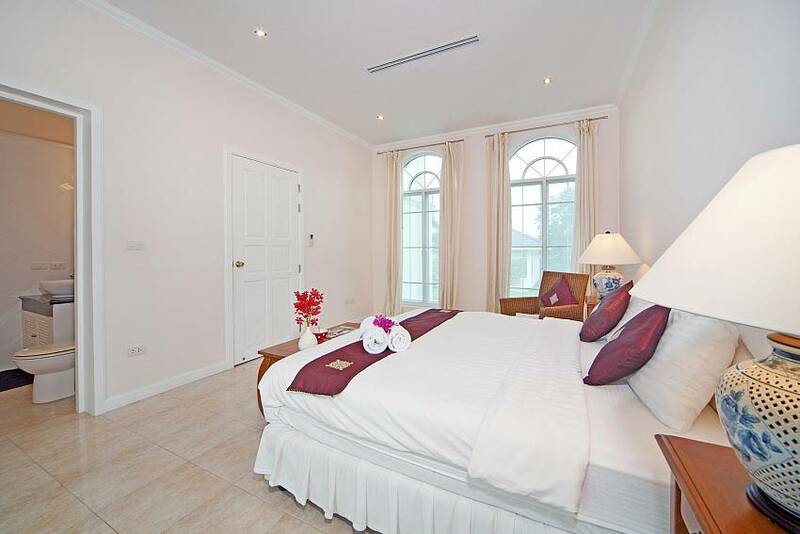 The mansion has 8 double en-suite bedrooms, 7 of which contain King size or double beds with the other containing 2 single beds. 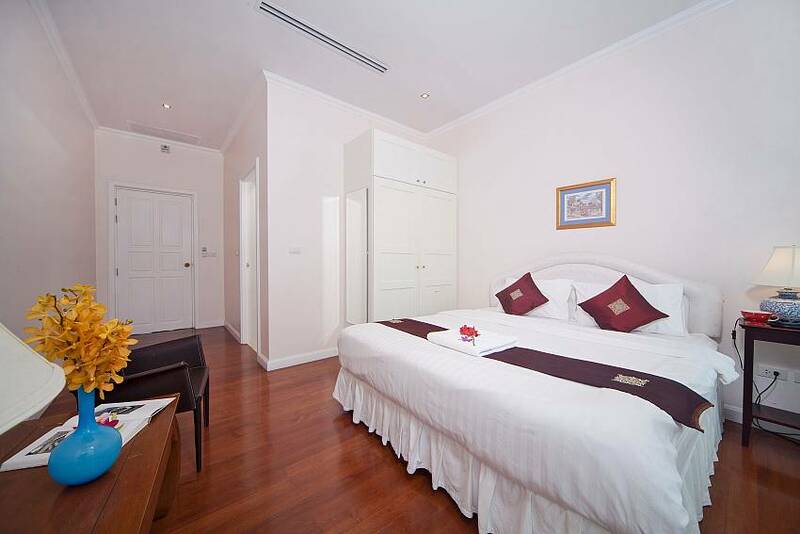 All bedrooms contain wardrobes, furniture and large windows, and each has its own bathroom. 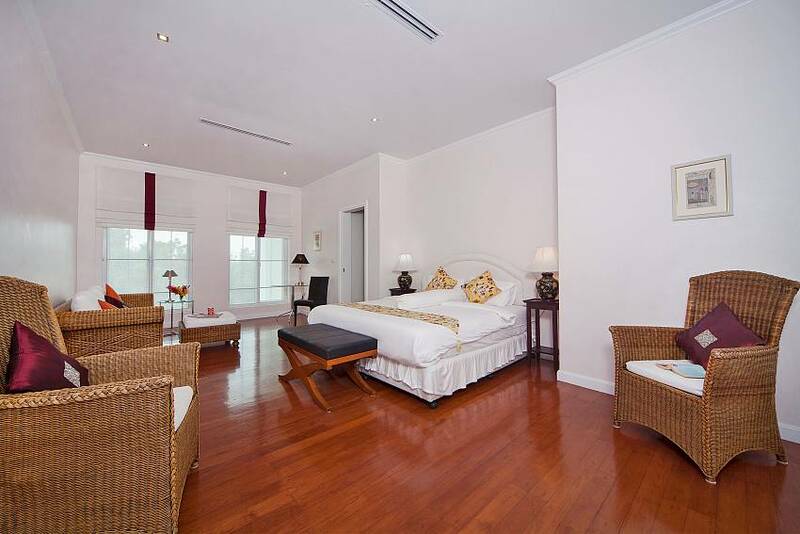 The Master suite is particularly impressive with a wicker sofa and matching armchairs. 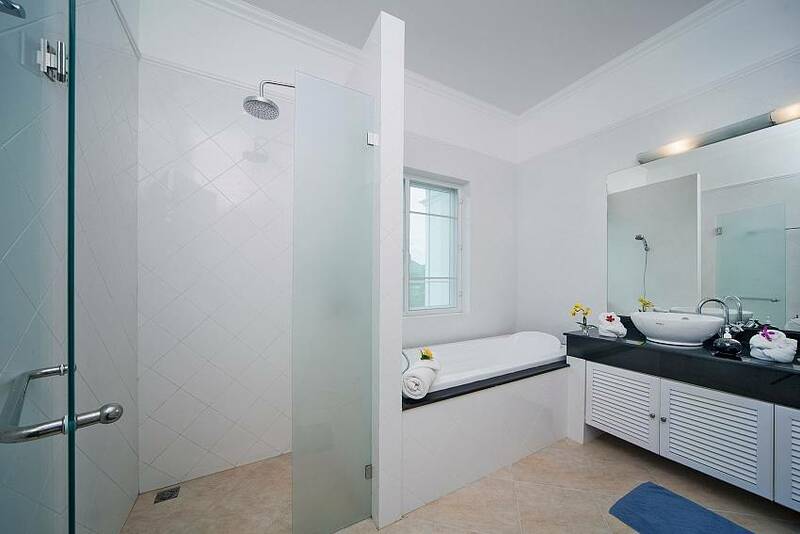 8 of the mansion’s 9 bathrooms are en-suite; some have a bathtub, all have glazed glass enclosed rain showers, stylish wash basins and western toilets. 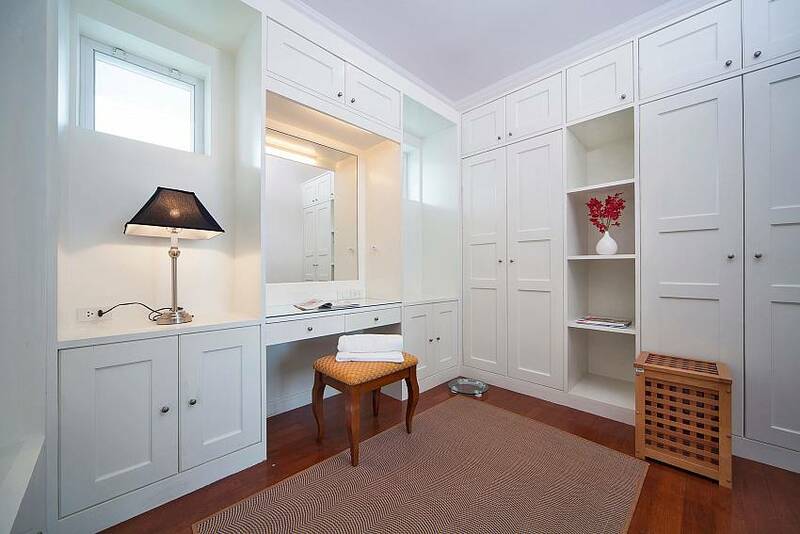 The Master bathroom has its own changing room, a bathtub and double wash basin. 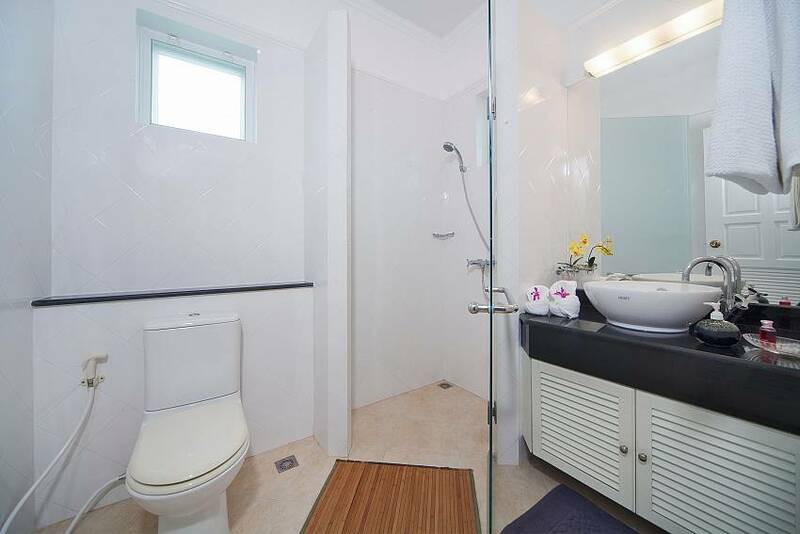 The 9th bathroom is off the downstairs lounge area for guest and communal use. 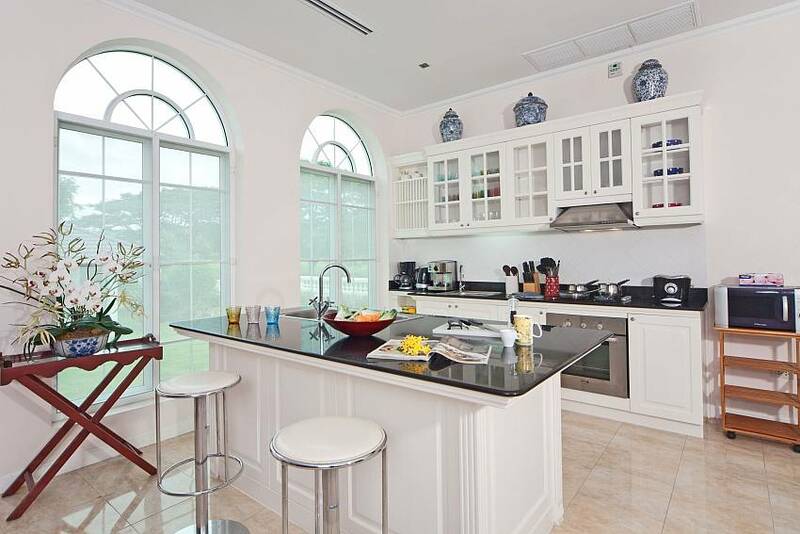 The fully fitted kitchen has an island with sink which is ideal for food preparation. The cooking hob, conventional oven and other appliances are below fitted cabinets which offer plenty of storage space. There is also a pantry/store cupboard with a large fridge/freezer and rice cooker. Next to the BBQ place is an additional outdoor kitchen. While you may wish to self-cater, a cook is available on a pre-booked per-meal basis if you would prefer to be completely pampered. There are 2 lounge spaces downstairs and two upstairs. As well as comfortable furniture, coffee tables and a writing table, one of the upstairs lounge areas offers a large flat screen television, DVD player and a surround sound system. Here you can relax and watch international channels or movies. Another living room in in the separated pool house. 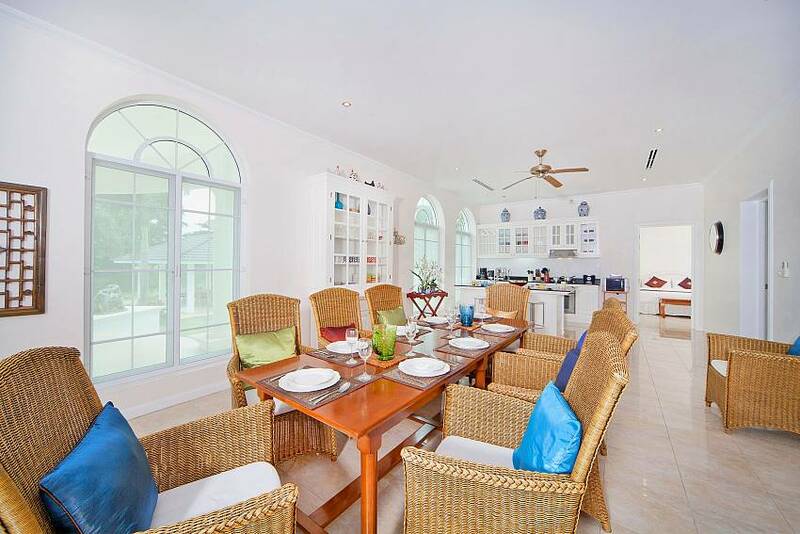 An impressive 10 place dining suite with wicker chairs is close to the kitchen. You will have a wonderful time dining here, and the option of hiring your own cook adds to the relaxed manner of your holiday. 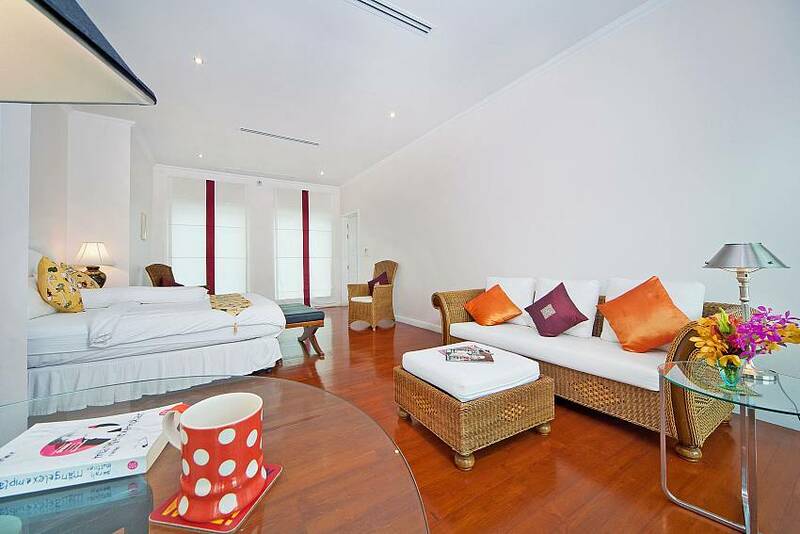 You can also eat comfortably in the large Dining Sala in the garden which also seats 10 around its wooden dining suite. "When we arrived at the property we were blown away by the "wow" factor. 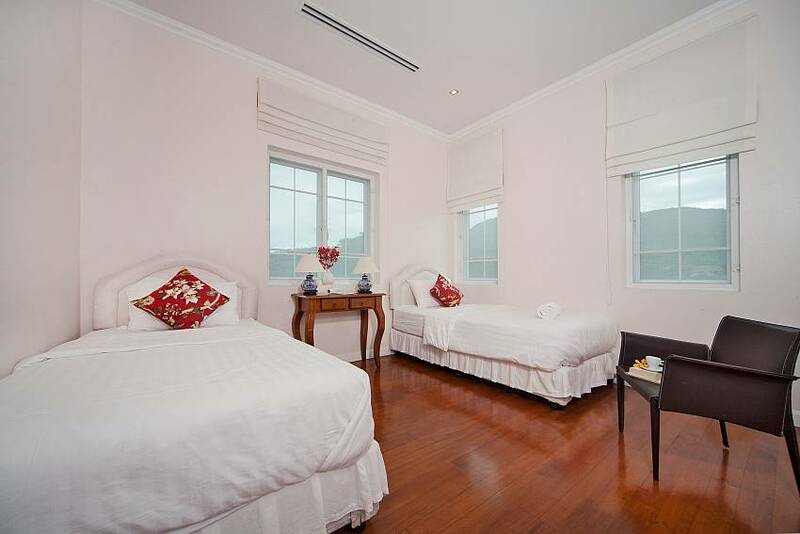 The house is a huge, gracious mansion with quality fixtures and furniture. 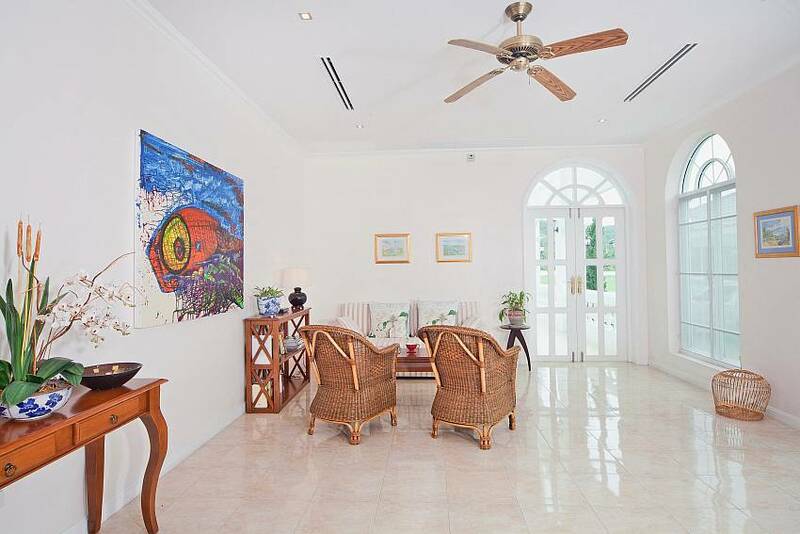 The house was immaculately clean and the large swimming pool overlooking the golf course was sparkling clean. 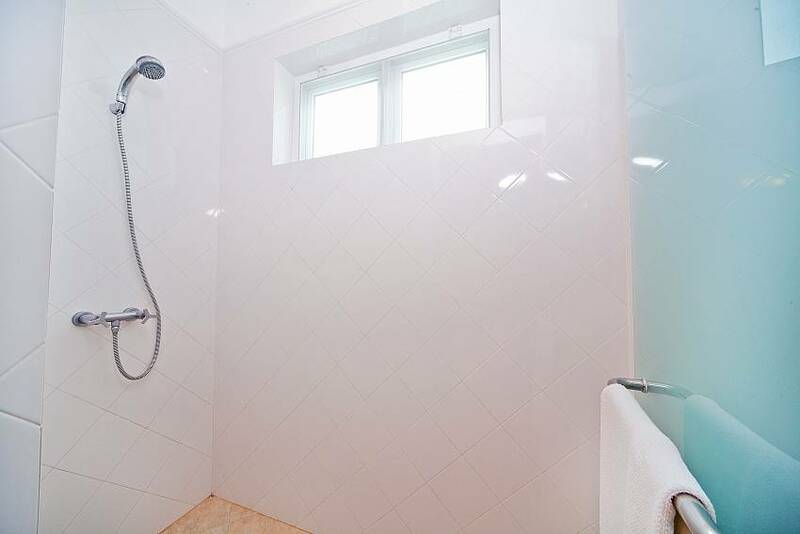 The description of the property on the web site, while impressive, was not as impressive as the property itself. The cleaning staff were very efficient and we were pleasantly surprised to find any dirty washing left on the floor was wisked away, washed and ironed and returned for a very modest fee. Great value. 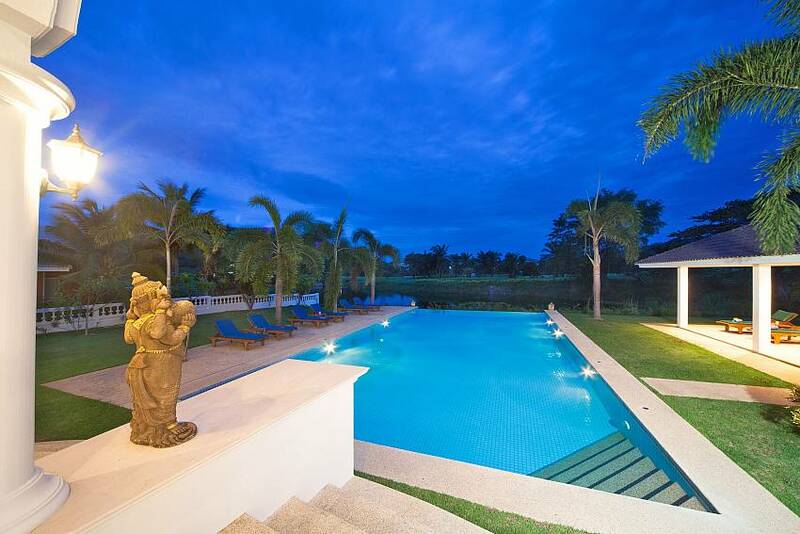 While a this property is a little way of Hua Hin city, the peace and tranquility and the outlook over Palm Hills Golf Course more than compensated for the 10 minute journey into town. Our group was 6 male golfers between 50-60 years of age with our own bus and driver (who was accommodated in the staff quarters). We each had our own bedroom and ensuite. Highly recommended for golf groups like ours. 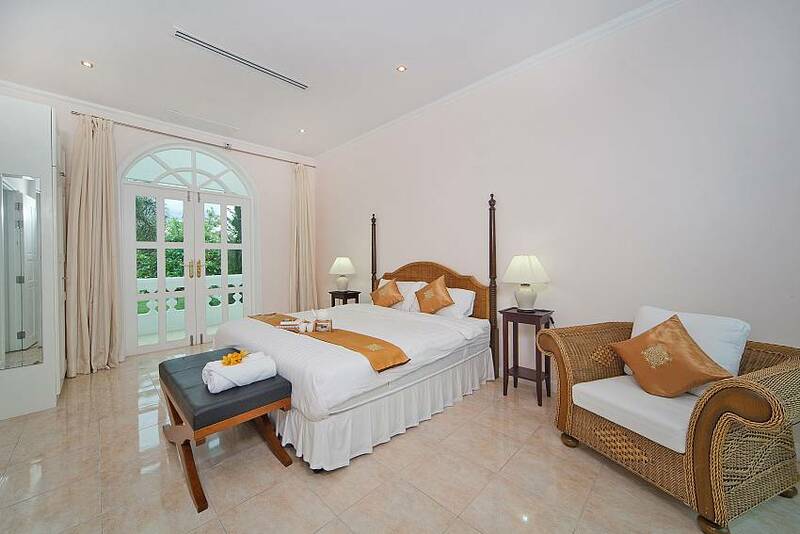 Even better value for couples as the property could accommodate 6 couples comfortably. 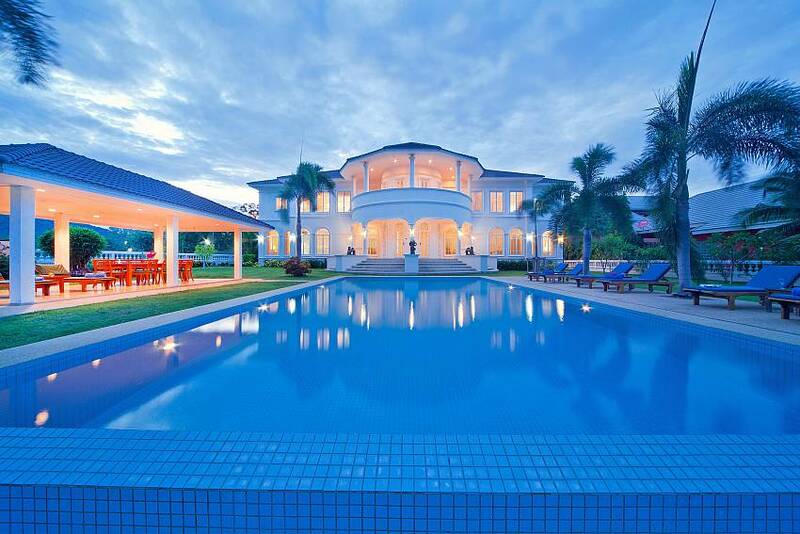 Overall I would rate this property 5 star and highly recommend it. While not a criticism, I would recommend that outdoor chairs be supplied around the table under the outdoor gazebo as it would be a lovely spot to sit and relax." "Villarenters Beside the problems with internet conection, and no english-spoken TV-channels, this property was just EXCELLENT. If we would be as many as 8 or more persons next time, I will defenetly rent this house again. April 2010 Frank S. Hansen Norway"
"Fabulous property within close proximity of all you require. Would have liked option of maid service." "We have just returned from Thailand where we hired out the villa for a week, for family and some friends following our oldest daughters wedding in Pranburi. 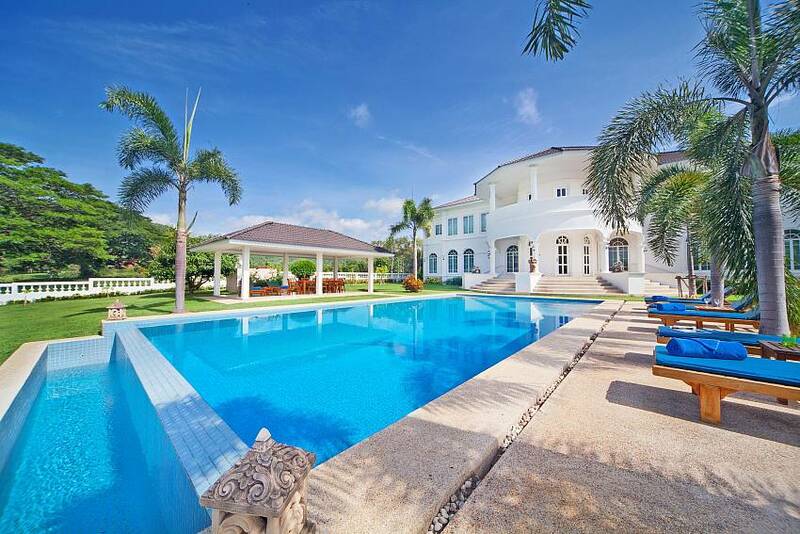 The villa is finished to an excellent standard and the pictures do not do it justice, as it is better in real life. We had a full party of 12 and due to the size of the property none of us ever felt cramped. 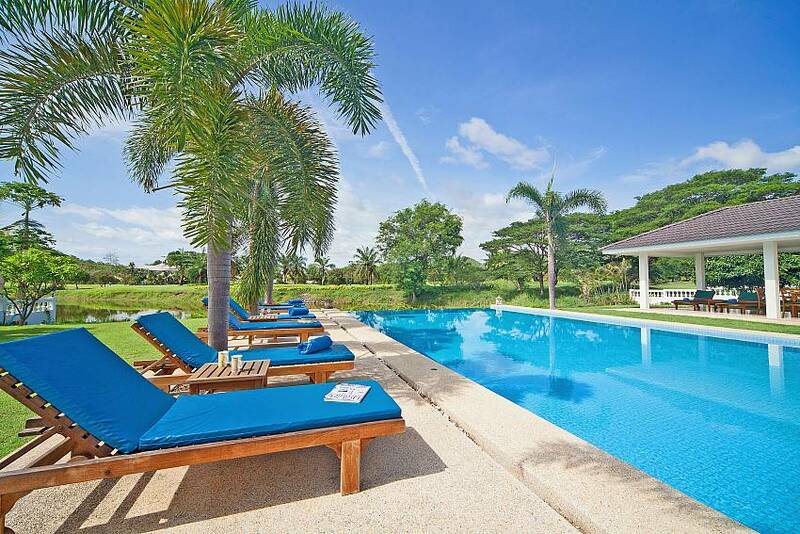 The location is fantastic for a relaxing holiday as it over looks the 8th tee of a very nice golf course. We managed to fit a couple of rounds of golf in and the green fees are reduced for residences of the properties. The caretaker of the property was excellent and nothing was ever too much trouble for her. All the party had a fantastic time and I would gladly recommend it to anyone. I would however like to make a couple of recommendations which may help future occupants. Firstly that a map of the golf course showing the properties is attached, as it was difficult to locate when first arriving and secondly, that a further 4 sun loungers are provided so that there is enough for all 12 occupants." 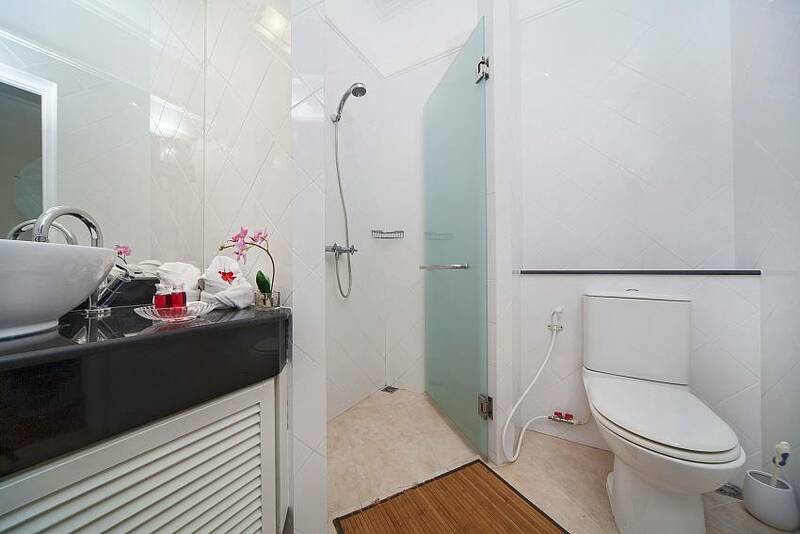 "This property is excellent. 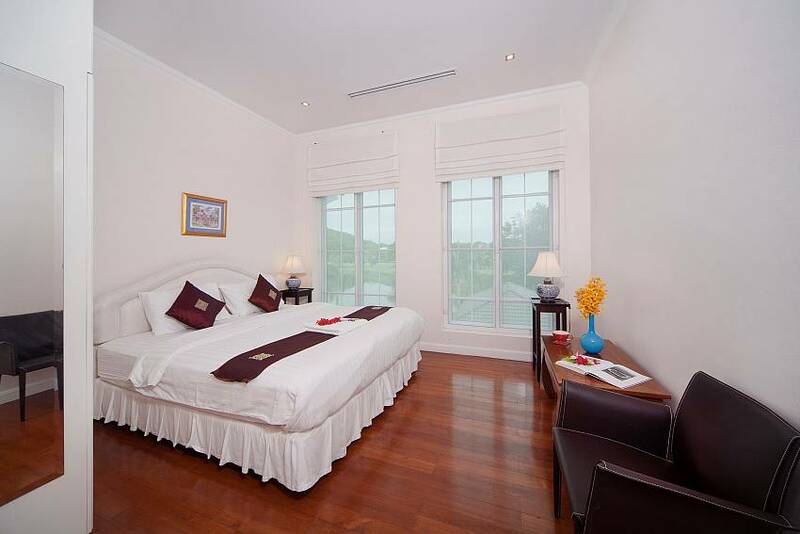 It is finished to a very high standard, especially for Thailand, and the location is perfect. 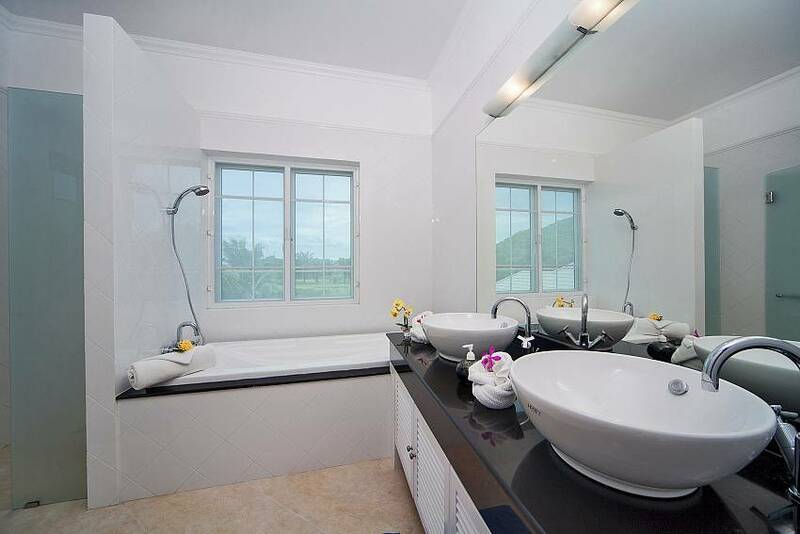 It is situated on a very pretty section of the golf course, and has beautiful relaxing views on both sides. Everything you need is provided and the hand over went extremly well. The directions could do with updating, as there is no mention of 6a anywhere in the direction list, and this was confusing, and here is also another house being built next door so it is now number 3 on the left. The construction could have been a pain, as it went on all day, but the views and the peacefulness of the surroundings made up for it, and besides, they have to keep building. This is a very special place, and I am very glad to have spent our christmas here. Many thanks to the owner." 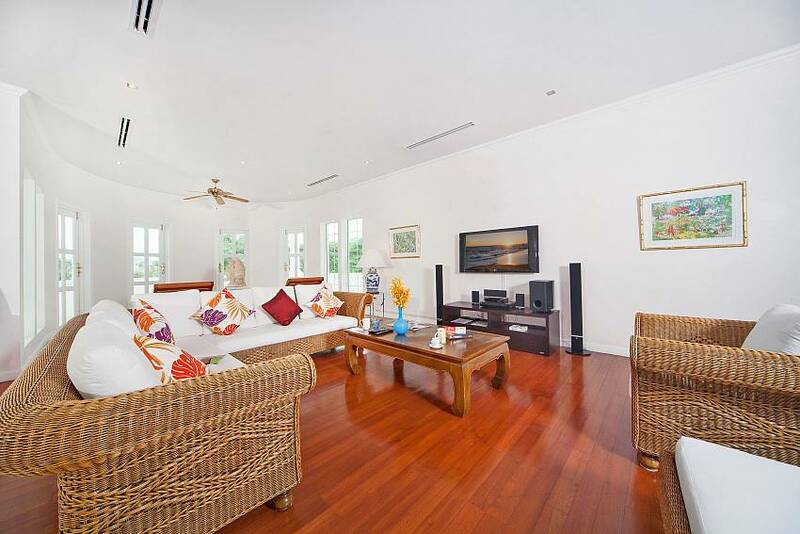 "The property was of a very high standard, it is a wonderful place to spend time on vacation. The actual house was better in real life than had been advertised (and theres not many times you can say that!) I had a fairly large party staying with me and due to size of the place we never felt cramped. When there was problem with the house the care taker got it fixed striaght away with out question. All my party had a fabulous time there and I would recommend it to anyone, I just hope I my schedule allows me to spend time there again."